As a result, many Aboriginal and Torres Strait Islander people live out our lives overshadowed by ongoing and relentless experiences of trauma. Cycles of trauma results in lifelong chronic illnesses and health implications for our people. It weighs heavy on all our hearts and if unaddressed, exacerbates drug and alcohol dependence and mental health risks such as anxiety, depression and suicide. We warn people against drug and alcohol dependence however – society should always be safeguarding against ever creating trauma because it is what is at the root of our public health crisis. But there are positive practices where Aboriginal and Torres Strait Islander communities are stepping up to and creating their own responses to social disadvantage and trauma. Envisioning change, I would like to imagine what children and young people can be and give to the world when they are free from discrimination. The nature of the challenge that we face is complex and overwhelming – but for the sake of our children, we must tackle this, one step at a time, one person at a time, one policy at a time. Yaningi warangira ngindaji yuwa muwayi ingirranggu, Boon Wurrung way Wurundjeri yani u.
I stand here today on the lands of the Boon Wurrung and Wurundjeri People. I acknowledge the people of the Kulin Nations, in particular the Boon Wurrung and Wurundjeri people, the traditional owners of the land upon which we meet today and I pay my respects to their elders both past and present, and the generations to come. I come from the Bunuba people, and Warangarri, my traditional lands in the Fitzroy Valley, Western Australia. Thank you to Sarah Joseph and your team from the Castan Centre for Human Rights Law for bringing us together and inviting me to speak to you all. Earlier today, I was reflecting on speaking here at an institute named after the late Ron Castan QC, who was a remarkable man. A steadfast human rights lawyer committed to advancing the rights of Australia’s First Peoples. As we recently commemorated the 25th anniversary of the Mabo No.2 High Court decision, we cannot forget those who stood by Koiki Mabo and his co-claimants to fight the decade long legal battle which ensued. I’d like to acknowledge Ron’s wife Nellie and their daughter Melissa who are here today. Nellie I treasure the memory of your visit to the Kimberley with your late husband a couple of years after the Mabo 2 High Court judgment. Your husband was such wonderful and cheerful company who reached out to all he encountered with his easy going manner and great sense of humour and conversation. His giant intellect was natural and inclusive and never consciously asserted. Although the judges of the High Court may have had a different view when he argued Koiki Mabo’s case so persuasively. I address you today as the first Aboriginal woman appointed to the role of the Aboriginal and Torres Strait Islander Social Justice Commissioner. Some of you here today may agree with me when I say that women are often the glue holding our communities together, particularly in times of stress. Like many Aboriginal and Torres Strait Islander women, I have multiple kinship and caring responsibilities as a mother, daughter, sister, aunt and as a community leader. I’d like to take note that this year represents 30 years since the Australian government funded programs and services to Aboriginal and Torres Strait Islander women. Aboriginal and Torres Strait Islander women are beginning to gain their voice in our society and I want to emphasise the importance of our role in weaving families and communities into being. In our many roles, we have a responsibility, to nurture and grow strong children, to pass on knowledge, mentor our young people, and listen to what the younger generations in our communities have to say about their lives. While each generation has sought to hold onto their future by addressing the challenges of the time, for far too long, the narrative of our fate has been held in the hands of others. It is now our time, to take hold of our future. We draw on our strengths, which are centred around our cultural identity, our unwavering connection to our country, our family and kinship, our languages, our song lines and ceremonies. And we stand on the shoulders of our leaders that have drawn from the same deep reservoir of strength. 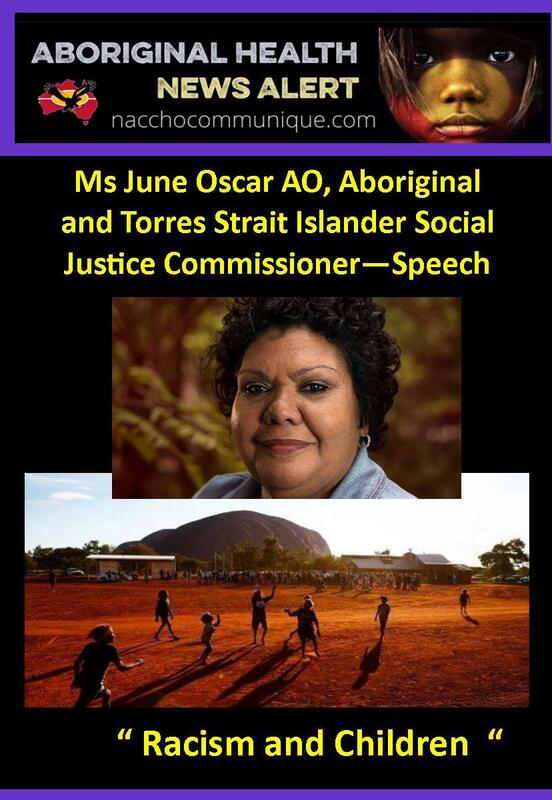 As the Aboriginal and Torres Strait Islander Social Justice Commissioner, it is my responsibility to report to the Australian Government on the exercise and enjoyment of human rights of Aboriginal and Torres Strait Islander peoples. Throughout my five-year term, I will advocate for and promote the great strengths of our peoples across our diverse communities. We know the strength that comes from our culture and this should be the starting point for many of the challenges that we face. It is what gives us the resilience we need and we know that resilience is the bedrock to combat the pervasive trauma that so many in our communities experience. We must invest in our most precious possessions – our children. We must invest in their safety, their protection and their quality of life. Sadly, our children have to be equipped with the tools to combat trauma in a rapidly changing world where the future will bring many complex and perplexing challenges. Overcoming racism in our society is one of these particular challenges. Under international human rights law, freedom from racism and racial discrimination is a fundamental human right. Australia has an obligation to ensure that children are protected against all forms of violence and discrimination, not least any discrimination that is racially motivated. In practice, human rights law doesn’t easily translate in our everyday lives – for Aboriginal and Torres Strait Islander people it can seem so unattainable that it becomes an irrelevant concept. During my term as Social Justice Commissioner, I want to make rights real for our people. Our rights are real and tangible. They are not abstract concepts. In September this year, we commemorate the 10 year anniversary of the United Nations Declaration on the Rights of Indigenous Peoples. The Declaration was developed by and for Indigenous peoples across the globe and it provides a framework on how to fully realise the human rights of Aboriginal and Torres Strait Islander Peoples across Australia. We need to be able to make this framework of human rights law and principle accessible and relevant in the daily lived experiences of Aboriginal and Torres Strait Islander peoples – there is a need for more rights awareness in our communities, in a language we can understand and has to be translated into tools for people to use. The language many of us understand is equality and equity – it is language that gives people fair and impartial access to their rights. Australia has expressed a commitment to upholding the Declaration’s principles. Imagine what it would be like to instil all our children with a zero tolerance to racism? Can we imagine a celebration of racial diversity where all our children are taught the proud and resilient history of Australia’s First Peoples? I’d like to imagine this for the sake of our children and this nation. But first, we have to understand what racism means – it puts a halt to people’s lives, it curtails their futures. When we discriminate based on race the likelihood is that we are destroying someone’s future. We know the outcome of racial discrimination, the more frequently it occurs over time, the more entrenched harm becomes. It is no secret; Australia’s First Peoples have endured systemic racial discrimination in this country and it is unsurprising that the majority of complaints made by Aboriginal and Torres Strait Islander people to the Australian Human Rights Commission are about racial discrimination. According to the 2016 Australian Reconciliation Barometer, both perceived and actual experiences of racism have actually increased with almost 40% of Aboriginal and Torres Strait Islander Australians reporting they had experienced verbal racial abuse in the last 6 months. These experiences can be relentless, numbing even. We often become so desensitised to the normalisation of social and institutional racism in this country that we do not think to call it out or make a formal complaint over the other priorities of daily life. And we cannot escape the fact that Aboriginal and Torres Strait Islander peoples experience constant exposure to racism, profoundly influencing the education, employment, housing, health and life outcomes for our people. It is true that there remains much unresolved, unreconciled and unfinished business for our people and this nation. Australia’s First Peoples have endured an intolerable amount of grief and trauma, which has had a splintering effect on our health and wellbeing for generations. There is no question that racism causes trauma. The brutal impact of colonisation that has displaced our people, has left a great wake in its path and has had a devastating impact on our communities. The growth of Australian society has established its own structures to maintain this position and brick by brick, has engulfed us. This legacy has left us as aliens in our own lands and lead to much of the structural racism and social disadvantage that we face today. A few years ago in my own community of Fitzroy Crossing, a high spate of youth suicides and alcohol related deaths brought about deep sadness within the community – coroner inquests noted that many of these deaths were preventable. It forced the women within my community to come together. We called for action on alcohol restrictions and we were met with much resistance, but we were determined to make things better for our community. We had to imagine the long term, permanent healing of the gaping wounds left from alcohol abuse in our community. We have a vested interest in the survival of our peoples and have to make hard decisions so that our people not only survive, but thrive. We also know that as Indigenous peoples, our contribution to the world is incredibly important. We sat down with families to understand their needs, built relationships with the local police, with local businesses and government service departments. At the core of any discussion, our strengths as cultural people laid the foundations to overcome these challenges. While not flawless, our approaches resulted in multipronged engagement across all sectors of the community and the delivery of wrap around services to assist families in need. Just last week I attended a regional roundtable on alcohol management in the Kimberley and it was a pleasure to see a broader discussion and participation from more stakeholders sitting with the Aboriginal leadership and working through future steps to address this situation at a regional level. This is what is required for greater, lasting impact for change. Our children and young people are our future – they are the next generation of leaders and lawmakers for our communities, they are the artists, scientist, writers and astronauts of tomorrow. Even though we experience setbacks, our people are achieving great things! We now have over 200 Aboriginal and Torres Strait Islander peoples who have been awarded their PhDs, having reached the highest level of academic attainment in the Western system. We must not lose sight of our positive gains. We must dream big! Our children are capable of doing all of these things and we better start believing it otherwise it won’t become reality. We know that when a child is given the best start in life, that child succeeds throughout their life. We all, of course, would like to see our children and young people succeed. It is incredibly exciting to think of what our children can become and about the type of modern and inclusive Australia they will inherit. We have no choice but to get things right! This year also commemorates the 20 year anniversary of the Commission’s Bringing them Home Report, which highlighted the pain and suffering of the children and families of our Stolen Generations. Many of the descendants from the stolen generation still carry trauma of their removal and time separated from their families with them. Again, these laws are further evidence of the structural racism which has affected and inhibited the lives of Aboriginal and Torres Strait Islander peoples. The power of laws to control our movements and the survival and cultural practices of our peoples and the current rates of removals speak to the enduring effect of these policies which have paralysed us. Knowing what we know now from the Bringing them Home Report, it is almost inconceivable that Aboriginal and Torres Strait Islander children today are being removed at an even greater rate than when the report was released! Aboriginal and Torres Strait Islander children are now almost 10 times more likely than non-Indigenous children to be in the out-of-home care system and numbers are set to triple by 2035. The child protection system is meant to safeguard the rights of children, keep them safe with the best interests of the child being the primary consideration. I also believe our communities are supposed to be where children feel safe and protected. In this regard, the child protection system has a role in strengthening families and ensuring the cultural security of communities. If a child is under the protection of child welfare, we need to consider the ways that that child remains connected to their culture, identity and community, rather than be taken away, cut off from the things that may be able to provide ongoing strength throughout their life. It is sad to say, that the child protection system has become a prerequisite for Aboriginal and Torres Strait Islander children and young people to enter the justice system. Alarmingly, more than half of Aboriginal and Torres Strait Islander children aged between 10-17 years are in juvenile detention. Over the last few years, we have seen increasing numbers of Aboriginal and Torres Strait Islander children and young people with complex behavioral and psychological needs being placed in the child protection and juvenile justice systems. There are many things we can do now to begin to break this cycle of trauma however what we are dealing with now is not acceptable. It is my view that these institutions are just not appropriately equipped to care for Aboriginal and Torres Strait Islander children generally, let alone our children with complex needs. I have seen this in my own community, working with mothers, their children and families who are dealing with the effects of foetal alcohol spectrum disorder or FASD. Some of the most vulnerable children in our communities are being exposed to irreparable harm and lifelong effects of trauma. We can prevent this but only if we understand, where it is coming from. Our children and families need access to therapeutic educational programs to deal with the effects of early life trauma and complex health related illnesses such as FASD. As our world is rapidly changing, these children will be waking as adults in a very different future. We have to consider giving them a future they deserve and equip them for what the future holds. We need to end the all too common and disturbing life trajectory of our children – it is imperative that we break the circuit! I’d like to briefly talk about the plight of a young Aboriginal man, Dylan Voller. Some of you may have seen the Four Corners program which exposed the abuse and neglect of children and young people, including Mr Voller in the Don Dale Youth Detention Centre in the Northern Territory. The centre was previously a maximum-security adult prison, now it’s a maximum-security detention centre for youths – of all youths detained in the Northern Territory, 95% are Aboriginal. Mr Voller had spent time in the child protection system and had a number of encounters with the law before he found himself in youth detention at the age of 11 years. The majority of his life to date has been spent in youth detention – what seems to be a revolving door for many of our young people that further descends down into a life in adult prison. The treatment of Dylan Voller and other youth at the Don Dale Detention Centre was the tipping point for our nation. The Royal Commission into the Protection and Detention of Children in the Northern Territory has heard appalling evidence of neglect and abuse of youth detainees – from being denied toilet breaks during transportation and having to ‘go’ in their own clothing to being hooded in restraint chairs, the use of tear gas and children being left in solitary confinement, sometimes naked, for prolonged periods. The purpose of youth detention is to detain and rehabilitate children who have broken the law. These institutions as they currently operate, are simply unable to do what is required to support our young people. We just cannot treat our children with violence and abuse and expect they will become non-violent law-abiding citizens. As we await the Royal Commission’s findings and recommendations, more stories of prison guards and people in positions of power sexually harming children at the Don Dale Youth Detention Centre is distressing and simply unacceptable! Although I am an optimist at heart, we must have hope and we must not give up demanding the change we need to heal our communities – our families and children. I am quietly optimistic to hear that Mr Voller, now a young adult, has received a suspended sentence, which, with the right supports, provides him with a chance to grow with opportunities for a better future. Though, I do also believe the recommendations in the Bringing them Home report are just as relevant today as they were 20 years ago. There is a resurgence and urgency to implement recommendations made in the past – now. for rules to be followed in every matter involving an Indigenous child or young person in the Juvenile justice system. far too many of our children are given custodial sentences for relatively minor offences – such as stealing a toothbrush because they are homeless. Systemic racism is a major obstacle to addressing these issues and our peoples are tired of the decades of reports and inquiries that have captured the experiences of our peoples only to be left largely not actioned and not implemented. As I said earlier, our culture is our strength. The best form of resilience we can give to our children is the therapeutic healing which comes from strong identity, our traditional medicines and practices. I also believe that through education, we can overcome many obstacles. Self-determined models of education are paving the way for our children. I have heard incredible successes achieved by Aboriginal owned and run schools such as the Murri School in Queensland. They provide a holistic learning environment for Aboriginal and Torres Strait Islander children and their families with healing camps and make available daily family support services. Education can provide a deeper understanding of the history, cultures and achievements of Aboriginal and Torres Strait Islander peoples. It can foster the development of empathy – to understand what it really means to walk in the shoes of an Aboriginal or Torres Strait Islander person in this country. We do have the power and responsibility as parents and elders to shape the thinking of our children. Their minds are like sponges, they are smart and when given the opportunity, are hungry to learn. I’d like to encourage you all to be mentors and have high expectations of our children so they are encouraged to achieve and be their best person and so that racism has no place in their lives. How can we rebuild and strengthen communities? We are beginning to see some education models taking the lead on this approach already. If we transfer the learnings and best practices from education settings to the child protection and youth justice arenas, our children may just have a chance in life. I’d also like to talk to you today about how the Australian Constitution is an instrument with the potential to both hinder and benefit the lives of Aboriginal and Torres Strait Islander peoples. You don’t need to be a constitutional lawyer to know that the constitution wasn’t written with the inclusion of the First Peoples of this country in mind. It is hard to imagine the drafters of the Australian constitution were not aware of the active social and political measures working at the time to deny, dehumanise or breed out our mere existence. For the most part of the last two centuries, we have been oppressed and excluded from wider society – from our own lands, our home. This complete disregard or denial of our existence and the violent history of this nation is often referred to as the Great Australian Silence. So for some, the constitution reminds us of the living examples of structural racism that frames our existence as Aboriginal and Torres Strait Islander peoples. Our nation has been reflecting upon the historical achievements of the 1967 referendum half a century ago this year. 50 years ago, our fellow Australians stood alongside Aboriginal and Torres Strait Islander peoples, united in the desire for change. We know that not enough change has occurred in the subsequent five decades but our nation has an opportunity to complete that journey. We know we just can’t continue to deny the rightful place Australia’s First Peoples have in this country. Moving forward together is our only option. I was at Uluru a few months ago, when our people spoke about the structural changes needed for our nation to come together in a meaningful way – in mutual respect and reciprocity. constitutional reforms to empower our people and take a rightful place in our own country. a Makarrata Commission to supervise a process of agreement-making between governments and First Nations and truth-telling about our history. These calls for structural change are not new. For generations, Aboriginal and Torres Strait Islander leaders have been calling for these things. Now more than ever, history and the future for our people to be self-determining needs to be set right! In fact, indigenous peoples across the globe are feeling like this now, that although our desires for a more humane society aren’t new, the urgency to create it is. We have got to find a way to reground ourselves where we are able to pursue self- determination, which is primarily a collective right but it also recognises rights of individuals in pursuing a better life. The changes made to the constitution in 1967 empowered the Commonwealth to make laws for Aboriginal and Torres Strait Islander people with the implied intention that these laws would be for our benefit. While there are only limited examples, we have seen occasions where the Australian Constitution has served as a powerful instrument in asserting our right to be treated as equal citizens. Ron Castan himself was adept in arguing for the Racial Discrimination Act 1975 to protect Indigenous peoples rights. In Mabo No1, the High Court had to consider whether Queensland legislation aimed to extinguish the claimed rights of the Meriam people to the Murray Islands, was constitutionally valid. The High Court agreed with Ron’s argument and found that the Queensland legislation contravened the Commonwealth Racial Discrimination Act 1975, applying the principle of non-discrimination in the enjoyment of property rights. And without the victory in Mabo 1, the High Court would not have heard Mabo 2. For the most part, the Racial Discrimination Act has provided a degree of legal protection for Aboriginal and Torres Strait Islander people who experience racial discrimination. However, it is important to note, the act has been suspended on three occasions at the expense of Aboriginal and Torres Strait Islander rights – one of those occasions was to enact the Northern Territory Emergency Response – or the Intervention as it has become known, 10 years ago. For our peoples, emergency responses such as the intervention, inquiries and reports have become a substitute for action and whilst I have real hopes for what recommendations come out of the Don Dale commission, we know that real change requires a generational commitment not bound by political cycles – that works with us to shift how Aboriginal and Torres Strait Islander peoples are currently able to participate in Australian society. We need structures, schools, safe spaces where we see ourselves reflected back to us, where we are respected, but also where our voices are heard. I don’t mean having a separate society for our peoples but one where we clearly see a place for ourselves in what exists around us. Sadly, many of our people do not see that as a part of their lived reality. Decades of powerlessness and feeling voiceless have really led to where we have arrived at with the Uluru Statement, and more recently the Referendum Council report recommendations. They are demands from our peoples to finally address the structural racism, which the Australian nation is founded upon – in a way that gives our peoples a permanent say in the matters that affect us. The nature of the challenge that we face is complex and overwhelming – but for the sake of our children, we must tackle this, one step at a time, one person at a time, one policy at a time. A voice gives us the ability to do that. On that note I would like to finish with a comment about the legacy of Ron Castan. He was a man of extraordinary integrity and wisdom who understood well Australia’s history and contemporary social and political character. He was someone who, I remember as being a genuine believer in arguing the merits of a case for the benefit of this nation as a whole. As we enter the serious process of political decision making about the appropriate question that the Australian Parliament decrees should be put to the Australian people at a Referendum about recognising Indigenous peoples in Australia’s Constitution, we should not shy away from being courageous and arguing for the right question. And we should never underestimate or prejudge the wisdom of the Australian people who we know from the 27th of May 1967 are more than capable of doing the right thing. The 2017 Human Rights photo competition is now open. The 2017 photo competition by the Australian Human Rights Commission explores the broad theme of Home, and we’ll showcase here a selection of the best photos you’ve sent us. Prize is a $600 voucher to spend at JB-Hifi, Apple or camera store.